Several years ago, when I was a young leader, I had a great leader that taught me many valuable lessons. The lessons I learned have stuck with me. That leader was very experienced, well known, and successful. One lesson he taught me was how to effectively lead by example. He explained three techniques that every good leader should follow. Teach followers what to do. It is very important to teach your followers how to do their jobs effectively and be good leaders by following successful leadership principles. This teaching should come in the form of verbal explanations. On many occasions, this teaching is done in a classroom setting. As the leader, you should verbally teach your followers to be good leaders so they can lead effectively when called upon. Show followers what to do. After the teaching phase, you should, through your actions, show your followers how to use the leadership principles. It is important for your followers to see you living the principles you taught. Your example proves to your followers that they can effectively live the principles you taught them. It confirms that the principles really are effective. Actively help followers to do. Take time to help your followers live the principles you’ve taught. Observe them as they do their jobs. Then sit with them to give feedback. Your feedback will help them to understand how they can be better. Explain what they need to change to be more effective. Be very careful when you give this feedback so it is done in a spirit of love and improvement. This feedback should not be given in a spirit of judgement or arrogance. If it is given in such a fashion, it may do more harm than good. 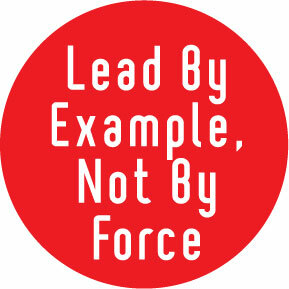 These three aspects of leading by example changed the way I approach leadership. It helped me to be a better leader. Put these three principles to the test you to see if it will change the way people approach you as their leader. Great points and all worth doing but personally I think this is more management than leadership. I really like the emphasis on “teach”, “show”, and “do”! Leadership takes action and effort, it isn’t something that just happens. Great leaders convey their message this way as well, and strengthen their vision. Love the post!